If you are looking for a good health, then nothing beats foods, Having rich food with lots of fat can make you fat, and on the other hand, eating proper amount of healthy food full will help make you a healthy person. 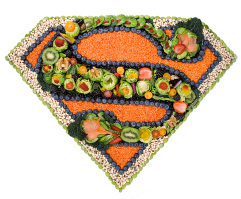 Here are 5 super foods that you should include in your meals every day. More good news: We've pulled together the quickest, tastiest ways to cook and serve these healing foods, from tried-and-true favorites to fresh, new ideas. 9 grams of monounsaturated fat to help slash LDLs ("bad" cholesterol) and boost HDLs ("good" cholesterol). 6% of your daily calcium and 20% of the magnesium you need--two minerals lower blood pressure. Just be sure to stop with one handful at snack time--advice that holds true for all nuts because they're calorie-dense (160 calories per serving). Apples earned spots on the USDA's top-20 list of antioxidant-rich foods thanks to hefty quantities of flavonoids (natural chemicals in plants that fight inflammation, and impede cancer). Apples are also a rich source of fiber. In a recent study at the University of California, Davis, people who ate two apples a day had fewer oxidized, artery-attacking LDLs than non-apple eaters. Go to our Apple Recipe Collection. Carrots are color therapy for your cardiovascular system. These veggies' brilliant orange hue is a sign of super-high levels of beta-carotene, an antioxidant that guards against artery-clogging oxidized LDL cholesterol. Only foods like carrots offer this protection. Cooked carrots have twice the antioxidant power of raw carrots because heat breaks down tough cell walls so that your body can use what's inside. Carrots also provide blood pressure-lowering potassium and magnesium, plus the homocysteine-lowering combination of folate; vitamin B6; and the antioxidants alpha-carotene, lutein, and zeaxanthin. Buy sliced and shredded carrots; add them to soups, salads, and casseroles. Your heart--and your waistline--love it when you have a milk mustache. (So, of course, do your bones!) Calcium and other minerals in milk help lower blood pressure by keeping arteries flexible and helping your kidneys flush pressure-boosting sodium out of your body. A glass of cold moo juice at lunch or a generous splash on your morning cereal could cut your risk of insulin resistance--a potent heart disease risk factor--by 71 percent, and help you lose weight. How? Mayo Clinic researchers suspect that calcium "down-regulates" fat absorption by fat cells and "up-regulates" fat burning. Make milk your drive-through thirst quencher. Eating beans four times a week could cut your risk of coronary heart disease by 20 to 30 percent. They're rich in LDL-lowering soluble fiber (2 grams in a 1/2-cup serving) and homocysteine-controlling folate, as well as blood pressure-easing potassium and magnesium. Thanks to healthy doses of fiber and protein, beans give you steady energy, not a sudden rise (and fall) of blood sugar that ups your risk of metabolic syndrome and weight gain. Healthy eating doesn't have to take extra time out of your busy day--reaching for an ounce of dark chocolate or a fistful of almond is as quick as grabbing a bag of chips. And the taste? Out of this world.